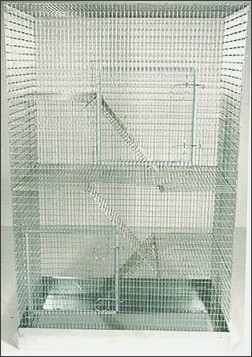 This auction is for 1 - Martin's cage Chinchilla Highrise ( FC-430HR ). The winning bidder of this auction can choose to add either a flip top or a slide out pan for $10.00 each. 30" x 18" x 48"
Construction: Martin's Cages are constructed of ½" by 1" galvanized-after weld wire to prevent babies from escaping. Ramps, balconies, and middle floors are constructed out of ½" x ½" galvanized wire mesh. Cages are spacious and provide plenty of room for a dusting pan, and several levels provide lots of exercise and play room for your chinchilla. Please Note: We recommend you wash your new cage before using. Galvanized after-weld cages can be neutralized with a 50% vinegar/50% water solution. Martin's cages can only be shipped via Federal Express in the United States. To calculate your shipping charges click here add the cage to the shopping cart, click the estimate shipping button in the right column. Enter your postal zip code and state then click the federal express tab.